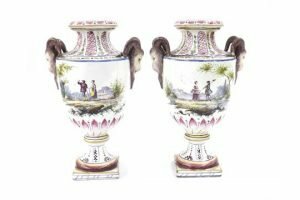 Pair of French faience glazed baluster vases, with twin ram head handles and painted with a romantic scene, Veuve Perrin factory mark. 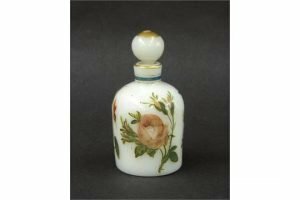 Attractive 19th century opaline glass scent bottle, hand painted with floral sprays and gilded highlights. 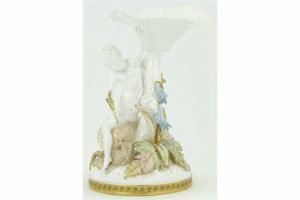 A Victorian Copeland china comport, in the form of a fairy riding a snail, with painted and gilded decoration. 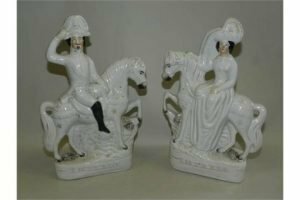 A pair of Staffordshire figures ‘Empress and Emperor of Prussia’ each modelled on horseback. 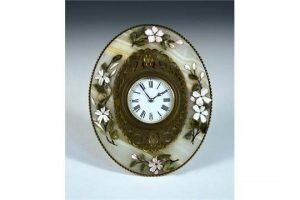 A late 19th century brass and agate strutt clock, retailed by Carlisle and Watts, Hanover Street, Edinburgh, the oval clock with painted and applied jade foliage, the enamel dial with black Roman numerals. 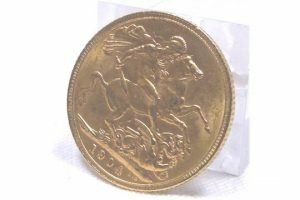 A 1904 King Edward VII 1904 full gold sovereign with George and Dragon verso. 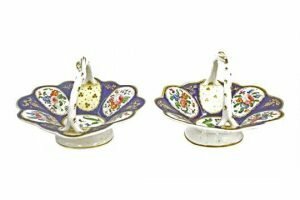 Pair of antique porcelain baskets in the manner of Derby, decorated with oval floral panels upon a cobalt blue ground with gilded highlights. 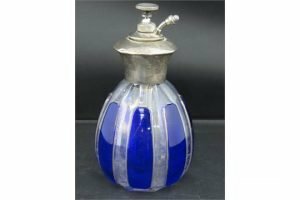 A vintage silver topped scent bottle marked Stirling silver, the glass base having ribbed striations in cobalt blue. 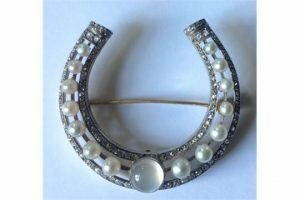 A Victorian style 18 carat gold and gem-set horseshoe brooch, the open design set throughout with rose cut diamonds, graduating cultured pearls. 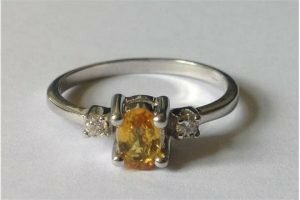 An 18 carat white gold, yellow sapphire and diamond ring, the oval brilliant cut sapphire in raised setting between two small round brilliant cut diamonds. 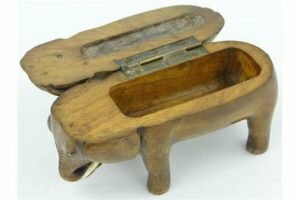 A carved and stained wood elephant design matchbox, with hinged cover and striker inside lid. 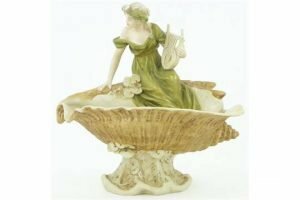 A Royal Dux porcelain bowl, in the form of a Classical woman playing a harp seated on a shell. 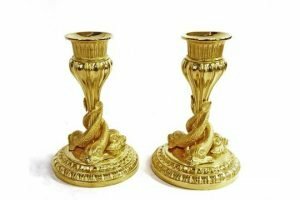 Decorative pair of French ormolu candlesticks, the fluted tapered columns applied with three coiled fish, upon stepped circular bases. 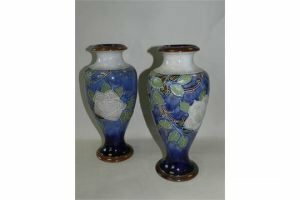 A pair of Doulton Lambeth stoneware vases, circa 1905, of baluster form and decorated with tubeline roses and foliage. 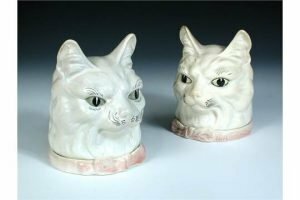 Two 20th century European pottery cat’s head boxes, the white cats with green eyes, their pink collars forming the base rims for the cylindrical containers within. 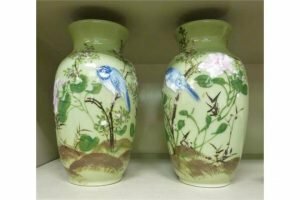 A pair of modern Japanese celadon glazed porcelain vases of baluster form, decorated with songbirds amongst flowering branches. 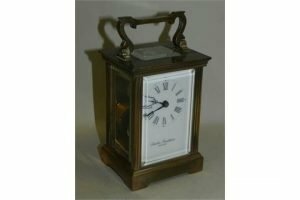 A brass mounted carriage timepiece, the white enamel dial with Roman numerals signed ‘Charles Frodsham, England’. 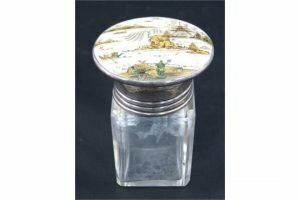 A silver topped dressing table bottle marked for Birmingham and having finely detailed Oriental gilded scenic decoration to the the lid. Square shaped bottle. 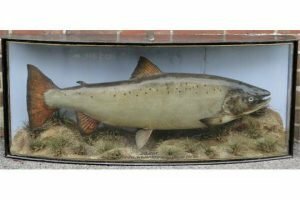 A large Edwardian taxidermic salmon, mounted in glazed bow front case, inscribed on front “Banchory on Dee, October 22nd 1908, weight 29.5lbs,” case length 3’11”, height 19.5″. 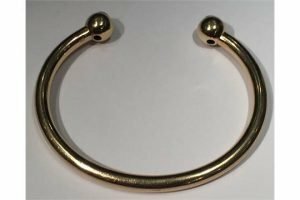 A 9 carat solid gold bangle of circular section, each spherical terminal inset with a diamond, the two round brilliant cut diamonds collet set, into outer surface of terminals, stamped ‘375’.